Chemical warfare, feminism, fast food, school holidays, food wastage, overpaid footballers and the legacy of the 2012 Olympics . . . 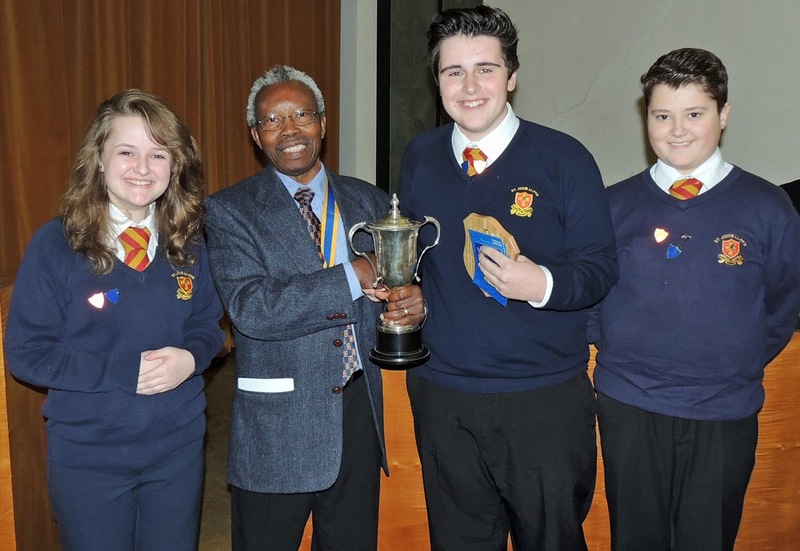 These were among the topics debated in the annual Llanelli Rotary Club Youth Speaks competition held at Llanelli Town Hall. “The quality of the arguments presented was outstanding and the children taking part reflected great credit on their schools and families,” said the chairman of the judging panel Lt Colonel David Mathias. The competition saw St John Lloyd scoop the team prizes in both the senior and junior intermediate section to progress to the next round of the Rotary competition – zone area and district finals. 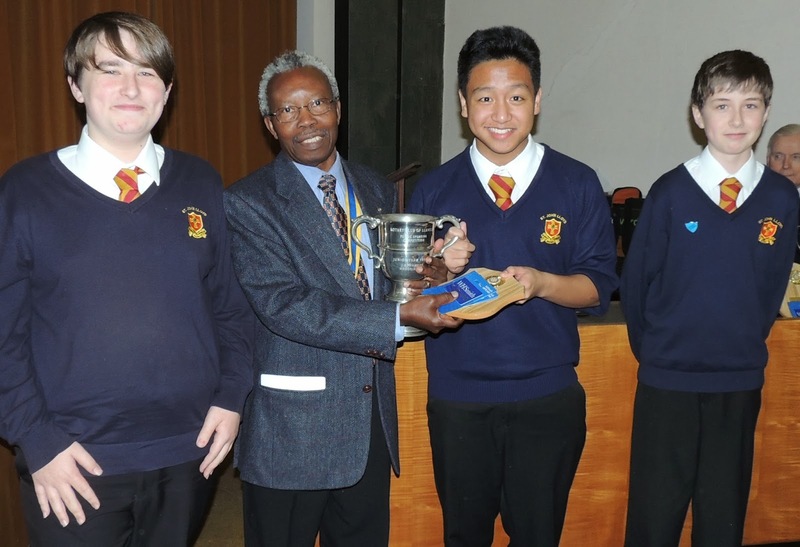 Last year, the St John Lloyd senior team made it all the way to the national Rotary finals in Hull. Lt Col Mathias said: “The standard in the competition was exceptionally high and the competitors made the judging task a very difficult one. Llanelli Rotary Club president Ken Abban explained that the Youth Speaks event offered an opportunity for Llanelli pupils to gain experience of speaking on a public platform. The competition was run to a national Rotary format which included a question from the floor. The main speaker for each team faced the daunting task of fielding an unrehearsed question from Rotarian Past President JC Williams MBE. Best Intermediate Team – St John Lloyd (who debated ‘We’re all going on a term-time holiday, what’s the big deal?’). Team members – Chair Jack Rees, Speaker Joseph Toft, Vote of thanks proposer Francis Venzon. Best Chair – Jack Rees, St John Lloyd. Best Speaker – Emyr al Razawik, Ysgol y Strade. Best Proposer of Vote of Thanks – Adam Evans, Bryngwyn. Best Senior Team – St John Lloyd (who debated ‘Is there really a red line in chemical warfare?’). Team members – Chair Blaze Roper, Speaker James McMillan, Vote of thanks proposer Greg David. Best Chair – Gwenno Evans, Ysgol y Strade. Best Speaker – James McMillan, St John Lloyd. Best Proposer of Vote of Thanks – Oliver Morgan, Ysgol y Strade. The judging panel was – Lt Colonel David Mathias DL (chair), Ann Brace, retired teacher from Tregib School, Llandeilo, and retired QE High Carmarthen headmaster Tim Day. The MC for the evening was Rotarian Past President Robert Lloyd. The event was organised by a team led by Rotarian Mark Evans. Prizes were handed out by Llanelli Rotary Club President Ken Abban. Senior organiser Mark Evans said he was delighted that seven out of a possible 10 teams from the Llanelli area had entered. Rotary organises many youth competitions – Youth Speaks in Welsh and English, Young Chef, Young Musician, Young Photographer and Young Interviewer. The next youth competition will be the Young Chef event which will be held at Bryngwyn School on January 29. Top - Best Senior Team – St John Lloyd, l to r, Blaze Roper, Greg David, James McMillan. Above - Best Intermediate Team – St John Lloyd, l to r,– Joseph Toft, Francis Venzon, Jack Rees.